Last winter we were invited by Corporex, a local developer and property manager, to enter a competition to design an immersive pedestrian experience and art installation at the Covington Riverfront Commons in Covington, Kentucky. We had a blast putting the competition entry together, however, we did not win the competition. PCA Architecture’s proposal “The Current” and “The Eddy” for the Covington River Commons is a sculptural homage to the City of Covington and its identity with the Ohio River and its role as a connector. The river acts as a conduit or "current" between many entities both physical and abstract; it is a connector between states, cultures, commerce, streams, rivers, and the ocean. We chose to create a unique sculptural experience that would attract people to visit this amazing site. The Large Pavilion, named “The Current,” is constructed using a series of steel or aluminum frames with an open section facing south, which forms the shape of the Ohio River as seen from above. The center of the pavilion represents where the site is located along the Ohio River. The structure will be light and airy as a contrasting element to the large monolithic buildings adjacent to the site. 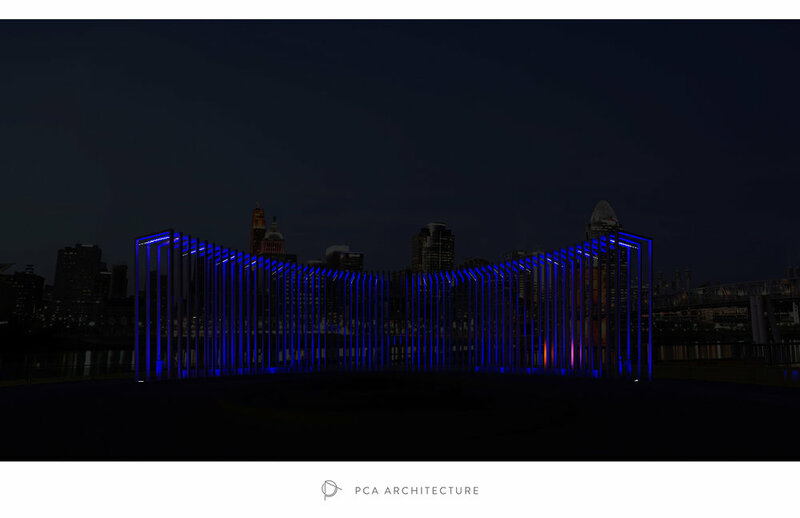 The pavilion will be lit with a series of color-changing LED lights. There is an opportunity to also have the LED lights programmed to change colors and even project patterns and images onto the pavilion. Our goal with the “The Current” is to create a space that is enjoyed both by car and by pedestrians alike. This centerpiece acts as a sculpture that can be seen from a great distance a mile away if one is looking down Madison Avenue in the heart of Covington. It also provides a visually intriguing scene from the Ohio side when looking south across the river. For pedestrians, "The Current" is an immersive experience as one can wander in and out of the sculpture while safely protected from vehicular traffic. Its placement allows visitors to take in the picturesque views of the river and Cincinnati with unimpeded views. The center of the area's drive lane has a radius that is large enough for a school bus to turn around, providing an opportunity for the city to install greenery and landscaping at its center. The center of the drive lane also provides an option for a stage where local artists could display artwork. Having a new artist create something for the site every year will help the community invest in the space, and will give citizens another reason to continually return to the site. There could also be community performances here as well as impromptu gatherings which would give the area even more notoriety. The Small Pavilion, named “The Eddy” is a creative take on a standard park pavilion while adding visual interest. It allows space for concession vendors to set up under it or around its perimeter. This layout creates a walkway out to the end of the plinth where dining tables and chairs can be placed to provide a nice dining experience along the Ohio River. The Current will bring the community together in a space that has until now been uninviting, despite its prime location next to the symbolic and literal connector of the Ohio River. Our firm can transform the space to be a more inclusive cultural, natural, and community-focused gathering space for diverse members of our community and tourists alike.